You know what is crazy about how incredibly badass these posters are? Only one of them is UFC. 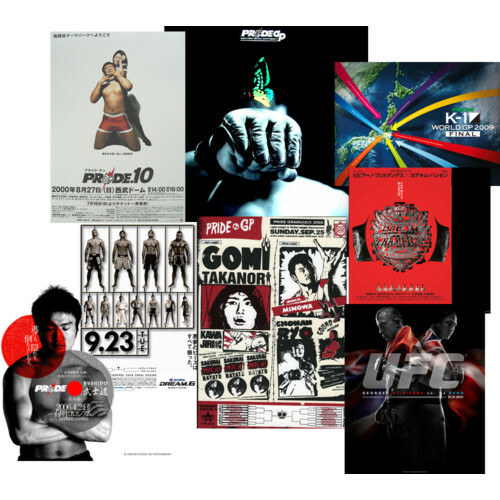 Strikeforce could have a leg up on UFC if they use Japanese poster designers. This Saturday is the Strikeforce card on CBS and boy oh boy I feel lucky. Not only are some awesome fights on this card, but I will be working so I will be able to watch it since it will be on CBS. Thank you, CBS. (I don’t know why, but I’m kind of upset Shields doesn’t have a nickname.) Shields may be coming off a 13-win streak, but I think the MMA gods have decided that 39-year-old Hendo will continue to fight. Even if he does have lame wardrobe choices, he has a chin that could cut through car doors and gives them love taps to put them to sleep. I can’t really say Shields would get lucky on his feet, because I think that’s what Bisping was expecting to do, too. If it goes to the ground, it’s over for Shields. 15 wins in a row. Repeat 15 WINS in a row. 28 wins, 2 losses. If you have never watched this kid (and I call him “kid” because he is a year younger than me – OLD!) fight, do yourself a favor. I can’t even pick one since the highlights are good, but watching how he develops in each fight is amazing. He has the indomitable talent of Anderson Silva, without the petulant displays. More like a Fedor mindset. King Mo is undefeated in his MMA career, and I do believe this fight will break that streak. AOKIIIII PANTS! Unfortunately in order to compete in Strikeforce, he had to give them up, but that won’t stop me drawing hearts around this adorable pic. Or this one. I hope for the sake of Japanese MMA he wins, but Gilbert is also pretty badass…a toughie!! The undercard fights are pretty obscure, but one I’m semi-interested in: Ovince St. Preux. For that name alone I want him to be a big star, just so everyone has to say it all the time. Oh-vahnce Sahnt Proh. Well, something like that. I am seriously excited for this. Thanks again CBS. Yay! We managed to disagree on one!